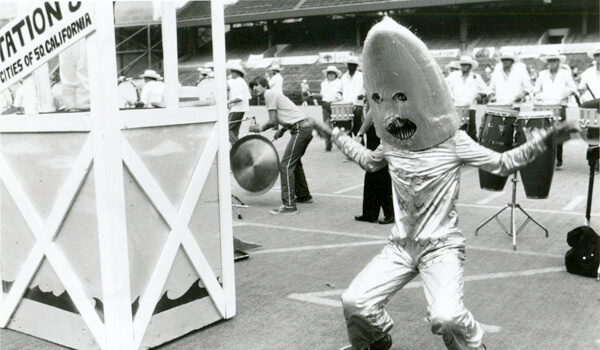 The DCI World Championships were originally scheduled to return to Miami for a second year in a row in 1984. Instead, the show got moved to Georgia Tech's Grant Field in Atlanta, where the Garfield Cadets' tenth-of-a-point Finals victory over Blue Devils gave the corps 76 wins over two consecutive seasons, a DCI record. Among the performance highlights was the Cadets' "surprise" company front near the end of their "West Side Story" show, Phantom Regiment's "phans" getting in the act by throwing streamers from the stands at the end of their corps' show, along with Velvet Knights' laid-back California wackiness. Velvet Knights' demeanor was somewhat a manifestation of their longtime director, Jack Bevins, one of the most easygoing people ever to grace the drum corps activity. The corps had a large mock-up of a "2 COOL VK" license plate that was often featured in their show. It played up the laidback attitude that permeated everything about the corps; their musical selections, their uniforms consisting of Red Converse shoes and wide-brim Panama hats (later replaced with red baseball caps), and an occasional bikini-clad member soaking up the rays of the stadium lights. Even the drum majors played the part, marching onto the field at the end of events with folding lounge chairs to wait out the announcement of scores. In Drum Corps International's 13th season in 1984, Velvet Knights' 12th-place finish would mark the first of eight appearances for the corps at the World Championship Finals. The corps' production started with the brass and percussion forming the outline of the block NBC logo. The music consisted of Tommy Newsom's "NBC Chimes Festival," written by a saxophonist in Doc Severinsen's NBC Orchestra, the house band for "The Tonight Show Starring Johnny Carson." Newsom was also the assistant director of the band, taking over whenever Severinsen was on the road or serving as Carson's sidekick when Ed McMahon was out. He arranged for musicians as diverse as jazz bandleader Woody Herman, pop artist John Denver, and opera superstar Beverly Sills. Newsom was well known as being a comic foil for Carson, who played up his seemingly bland demeanor and style. Newsom wrote "NBC Chimes Festival" for the band's album, "Live from Beautiful Downtown Burbank," and was based on the three-note NBC chimes that informed local radio and television stations that it was time for a government-mandated station break identification before each hour in the earlier days of network broadcasts. The motif was the first audio cue trademarked in the United States. Snippets of "Hooray for Hollywood," "There's No Business Like Show Business" and the "Johnny Carson Theme" were sprinkled into the mix, though they are not to be found in Newsom's original work. Joseph Curiale's "Centurion Starfire" was next. Curiale is a prolific composer for orchestra whose works have been performed by a number of World Class corps including Carolina Crown, Troopers, Mandarins, Glassmen and the Academy. A percussion featured titled "Seaside Samba" followed. Toward the end, the drum major raised a yellow flag with a black dot atop his podium, which was made to look like a lifeguard station. It's the common California beach patrol flag telling people that there is no surfing due to hazardous conditions. Prior to the closer, the corps decided to pay a visit to the beach, which was a recurring theme in a few of their later shows. Members of the color guard wore snorkels and facemasks while the contra tubas and timpani played the opening repetitive two-pitch theme from "Jaws." One contra had his instrument bell covered with shark teeth and a large shark's fin stuck atop his instrument. The Caribbean-flavored "All Night Long" closed out Velvet Knight's production, which is a tune from Lionel Richie's second solo album, "Can't Slow Down." Prior to his solo career, Richie was the former lead singer with the Commodores. The piece was intentionally light and breezy in character, featuring a dancer doing "the worm" on the field and a "record skip" that temporarily kept the corps stuck in the groove. With a hint of a reprise of "NBC Chimes Festival," colors of the tail of the NBC peacock logo were unveiled in nine long banners that spread out from the 50-yard line just like the logo, putting a memorable visual exclamation mark on the end of the show. 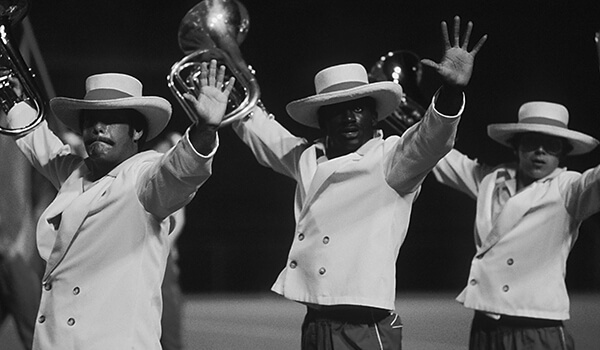 After earning a top-12 finalist spot for the first time in 1984, Velvet Knights maintained that honor through 1990. The corps returned for one last time in 1992 before fielding its last production in 1996. For this week only, you can save on the Legacy Collection DVD that contains this complete Velvet Knights performance, along with all finalists from the 1984 DCI World Championships. Discount DVD offer ends Monday, March 10.